"Labour union" redirects here. For the Polish political party, see Labour Union (Poland). For the Canadian political party, see Union Labour. For the album by King Syze, see The Labor Union. "Unionized" redirects here. For the chemistry term, see ionization. Since the publication of the History of Trade Unionism (1894) by Sidney and Beatrice Webb, the predominant historical view is that a trade union "is a continuous association of wage earners for the purpose of maintaining or improving the conditions of their employment." Karl Marx described trade unions thus: "The value of labour-power constitutes the conscious and explicit foundation of the trade unions, whose importance for the […] working class can scarcely be overestimated. The trade unions aim at nothing less than to prevent the reduction of wages below the level that is traditionally maintained in the various branches of industry. 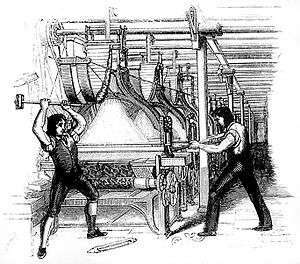 That is to say, they wish to prevent the price of labour-power from falling below its value" (Capital V1, 1867, p. 1069). The origins of trade unions can be traced back to 18th century Britain, where the rapid expansion of industrial society then taking place, drew women, children, rural workers and immigrants into the work force in large numbers and in new roles. This pool of unskilled and semi-skilled labour spontaneously organized in fits and starts throughout its beginnings, and would later be an important arena for the development of trade unions. Trade unions have sometimes been seen as successors to the guilds of medieval Europe, though the relationship between the two is disputed, as the masters of the guilds employed workers (apprentices and journeymen) who were not allowed to organize. 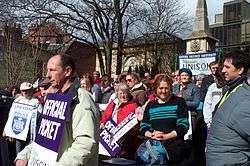 Trade unions and collective bargaining were outlawed from no later than the middle of the 14th century when the Ordinance of Labourers was enacted in the Kingdom of England. As collective bargaining and early worker unions grew with the onset of the Industrial Revolution, the government began to clamp down on what it saw as the danger of popular unrest at the time of the Napoleonic Wars. 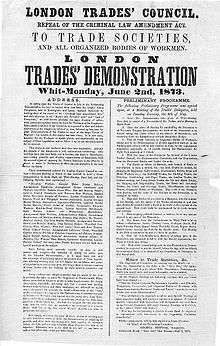 In 1799, the Combination Act was passed, which banned trade unions and collective bargaining by British workers. Although the unions were subject to often severe repression until 1824, they were already widespread in cities such as London. Workplace militancy had also manifested itself as Luddism and had been prominent in struggles such as the 1820 Rising in Scotland, in which 60,000 workers went on a general strike, which was soon crushed. Sympathy for the plight of the workers brought repeal of the acts in 1824, although the Combination Act 1825 severely restricted their activity. The first attempts at setting up a national general union were made in the 1820s and 30s; the National Association for the Protection of Labour was established in 1830 by John Doherty, after an apparently unsuccessful attempt to create a similar national presence with the National Union of Cotton-spinners. The Association quickly enrolled approximately 150 unions, consisting mostly of textile related unions, but also including mechanics, blacksmiths, and various others. Membership rose to between 10,000 and 20,000 individuals spread across the five counties of Lancashire, Cheshire, Derbyshire, Nottinghamshire and Leicestershire within a year. To establish awareness and legitimacy, the union started the weekly Voice of the People publication, having the declared intention "to unite the productive classes of the community in one common bond of union." The prevalence of unions in various countries can be assessed using the measure "union density". The definition of union density is "the proportion of paid workers who are union members". Trade unions in Germany have a history reaching back to the German revolution in 1848, and still play an important role in the German economy and society. The most important labour organization is the German Confederation of Trade Unions (Deutsche Gewerkschaftsbund or DGB), which represents more than 6 million people (31 December 2011) and is the umbrella association of several single trade unions for special economic sectors. Trade unions (Danish: Fagforeninger, Swedish: Fackföreningar) has a long tradition in Scandinavian society. Beginning in the mid-1800s, trade unions today have a large impact on the nature of employment and worker's rights in many of the Nordic countries. One of the largest trade unions in Sweden is the Swedish Confederation of Trade Unions, (LO, Landsorganisationen), incorporating unions such as the Swedish Metal Worker's Union (IF Metall = Industrifacket Metall), the Swedish Electrician's Union (Svenska elektrikerförbundet) and the Swedish Municipality Worker's Union (Svenska kommunalarbetareförbundet). Today, the highest rates of union membership are in the Scandinavian countries. In 2010, the percentage of workers belonging to a union (or total labour union "density") was 68.3% in Sweden and 54.8% in Norway, while it was 34.9% in Ireland and 18.4% in Germany. Excluding full-time students working part-time, Swedish union density was 70% in 2011, 2012 and 2013. In all the Nordic countries with a Ghent system—Sweden, Denmark and Finland—union density is about 70%. The considerably raised fees to Swedish union unemployment funds carried out by the new center-right government in January 2007 caused large membership losses in both unemployment funds and trade unions. From 2006 to 2008 union density declined by six percentage points: from 77% to 71%. With 54% of the workers belonging to a union Belgium is a country with one of the highest percentages of labour union membership. Only the Scandinavian countries have a higher labour union density. The biggest union with around 1.7 million members is the Christian democrat Confederation of Christian Trade Unions (ACV-CSC) which was founded in 1904. The origins of the union can be traced back to the "Anti-Socialist Cotton Workers Union" that was founded in 1886. The second biggest union is the socialist General Federation of Belgian Labour (ABVV-FGTB) which has a membership of more than 1.5 million. The ABVV-FGTB traces its origins to 1857, when the first Belgian union was founded in Ghent by a group of weavers. The socialist union, in its current form, was founded in 1898. The third 'big' union in Belgium is the liberal General Confederation of Liberal Trade Unions of Belgium (ACLVB-CGSLB) which is relatively small in comparison to the first two with a little under 290 thousand members. The ACLVB-CGSLB was founded in 1920 in an effort to unite the many small liberal unions. Back then the liberal union was known as the "Nationale Centrale der Liberale Vakbonden van België". In 1930 the ACLVB-CGSLB adopted its current name. Besides these "big three" there is a long list of smaller unions, some more influential then others. These smaller unions tend to specialize in one profession or economic sector. Next to these specialized unions there is also the Neutral and Independent Union that reject the pillarization that, according to them, the "big three" represent. There is also a small Flemish nationalist union that exists only in the Flemish-speaking part of Belgium, called the Vlaamse Solidaire Vakbond. The last Belgian union worth mentioning is the very small, but highly active anarchist union called the Vrije Bond. Labour unions are legally recognized as representatives of workers in many industries in the United States. Their activity today centres on collective bargaining over wages, benefits and working conditions for their membership, and on representing their members in disputes with management over violations of contract provisions. Larger unions also typically engage in lobbying activities and supporting endorsed candidates at the state and federal level. The economist Joseph Stiglitz has asserted that, "Strong unions have helped to reduce inequality, whereas weaker unions have made it easier for CEOs, sometimes working with market forces that they have helped shape, to increase it". The decline in unionization since the Second World War in the United States has been associated with a pronounced rise in income and wealth inequality and, since 1967, with loss of middle class income. Collective bargaining was first recognized in 1937, following a strike by the United Auto Workers at the General Motors' plant in Oshawa, Ontario. Justice Ivan Rand issued a landmark legal decision following a strike in Windsor, Ontario, involving 17,000 Ford workers. 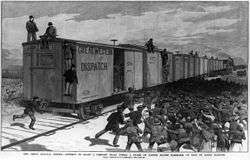 He granted the union the compulsory check-off of union dues. Rand ruled that all workers in a bargaining unit benefit from a union-negotiated contract. Therefore, he reasoned they must pay union dues, although they do not have to join the union. Prominent domestic unions in Canada include ACTRA, the Canadian Union of Postal Workers, the Canadian Union of Public Employees, the Public Service Alliance of Canada, the National Union of Public and General Employees, and Unifor. International unions active in Canada include the International Alliance of Theatrical Stage Employees, United Automobile Workers, and United Steelworkers. During these 40 years, the primary aim of the labour unions was not to benefit the workers, but to carry out the state's economic policy under their cosy relationship with the ruling party. This economic policy, which peaked in the 1950 and 1960s with the so-called "Mexican Miracle", saw rising incomes and improved standards of living but the primary beneficiaries were the wealthy. In India the Trade Union movement is generally divided on political lines. According to provisional statistics from the Ministry of Labour, trade unions had a combined membership of 24,601,589 in 2002. As of 2008, there are 11 Central Trade Union Organisations (CTUO) recognized by the Ministry of Labour. India's largest trade union, with nearly 2,000,000 members, is the Self Employed Women's Association (SEWA) which protects the rights of Indian women working in the informal economy. In addition to the protection of rights, SEWA educates, mobilizes, finances, and exalts their members' trades. 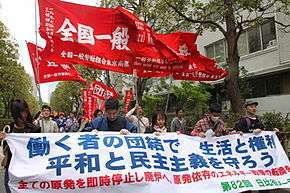 Labour unions emerged in Japan in the second half of the Meiji period as the country underwent a period of rapid industrialization. Until 1945, however, the labour movement remained weak, impeded by lack of legal rights, anti-union legislation, management-organized factory councils, and political divisions between “cooperative” and radical unionists. In the immediate aftermath of the Second World War, the US Occupation authorities initially encouraged the formation of independent unions. Legislation was passed that enshrined the right to organize, and membership rapidly rose to 5 million by February, 1947. The organization rate, however, peaked at 55.8% in 1949 and subsequently declined to 18.2% (2006). The labour movement went through a process of reorganization from 1987 to 1991 from which emerged the present configuration of three major labour union federations, Rengo, Zenroren, and Zenrokyo, along with other smaller national union organizations. In Western Europe, professional associations often carry out the functions of a trade union. In these cases, they may be negotiating for white-collar and/or professional workers, such as physicians, engineers or teachers. Typically such trade unions refrain from politics or pursue a more liberal politics than their blue-collar counterparts. In the Anglo-Saxon System of labour market regulation, the government's legislative role is much more limited, which allows for more issues to be decided between employers and employees and any union and/or employers' associations which might represent these parties in the decision-making process. 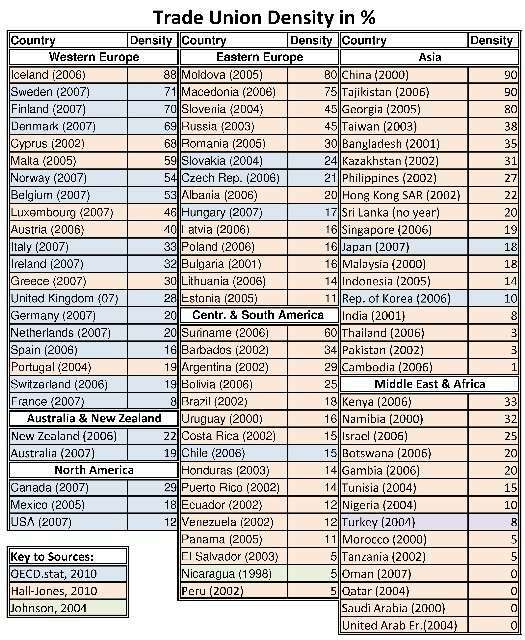 However, in these countries, collective agreements are not widespread; only a few businesses and a few sectors of the economy have a strong tradition of finding collective solutions in labour relations. Ireland and the UK belong to this category, and in contrast to the EU core countries above, these countries first joined the EU in 1973. The United States takes a more laissez-faire approach, setting some minimum standards but leaving most workers' wages and benefits to collective bargaining and market forces. Thus, it comes closest to the above Anglo-Saxon model. Also the Eastern European countries that have recently entered into the EU come closest to the Anglo-Saxon model. Trade unions have been accused of benefiting insider workers, those having secure jobs, at the cost of outsider workers, consumers of the goods or services produced and the shareholders of the unionized business. 1 2 3 4 Poole, M., 1986. Industrial Relations: Origins and Patterns of National Diversity. London UK: Routledge. ↑ "Trade Union Census". Australian Bureau of Statistics. Retrieved July 27, 2011. ↑ (1928). The Guild and the Trade Union. The Age. ↑ Kautsky, Karl (April 1901). "Trades Unions and Socialism". International Socialist Review. 1 (10). Retrieved July 27, 2011. ↑ G. D. H. Cole (2010). Attempts at General Union. Taylor & Francis. p. 3. ↑ "Trade union". Encyclopedia Britannica. ↑ Bernstein, Aaron (May 23, 1994). "Why America Needs Unions But Not the Kind It Has Now". BusinessWeek. ↑ Johnson, S., 2004. An empirical examination of union density in six countries: Canada, Ecuador, Mexico, Nicaragua, the United States and Venezuela. Washington, DC, US: Inter-American Development Bank, Research Network Working Paper £R-487, p.5, available at: http://www.iadb.org/res/publications/pubfiles/pubR-487.pdf. ↑ Johnson, S., 2004. "An empirical examination of union density in six countries: Canada, Ecuador, Mexico, Nicaragua, the United States and Venezuela." Washington, DC, US: Inter-American Development Bank, Research Network Working Paper £R-487, available at: http://www.iadb.org/res/publications/pubfiles/pubR-487.pdf. ↑ OECD, 2010. 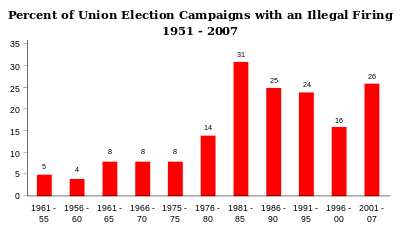 Statistics on Trade Union Density. Paris, France: OECD.stat Extracts Web¬site [online]. Available at: http://stats.oecd.org/Index.aspx?DataSetCode=UN_DEN. ↑ Schifferes, Steve (8 March 2004). "The trade unions' long decline". BBC News. Retrieved 16 January 2014. ↑ "United Kingdom: Industrial relations profile". EUROPA. 15 April 2013. Retrieved 16 January 2014. ↑ "Trade Union Density" OECD StatExtracts. 2010. Accessed: 28 April 2013. ↑ Trade Union Density OECD. StatExtracts. Retrieved: 17 November 2011. ↑ Keith Naughton, Lynn Doan and Jeffrey Green (February 20, 2015). As the Rich Get Richer, Unions Are Poised for Comeback. Bloomberg. Retrieved March 6, 2015. ↑ Stiglitz, Joseph E. (2012-06-04). The Price of Inequality: How Today's Divided Society Endangers Our Future (Kindle Locations 1148-1149). Norton. Kindle Edition. ↑ Barry T. Hirsch, David A. Macpherson, and Wayne G. Vroman, "Estimates of Union Density by State," Monthly Labor Review, Vol. 124, No. 7, July 2001. ↑ Retrieved July 14, 2013. 1 2 3 Dan La Botz U.S.-supported Economics Spurred Mexican Emigration, pt.1, interview at The Real News, May 1, 2010. ↑ Juan Montes; José de Córdoba (21 December 2012). "Mexico Takes On Teachers Over School Control". Wall Street Journal. 1 2 3 "Historia del Sindicalismo". SITRAPEQUIA website (in Spanish). San José: Sindicato de Trabajadores(as) Petroléros Químicos y Afines. 2014. Retrieved 4 May 2014. ↑ Herrera, Manuel (30 April 2014). "Sindicatos alzarán la voz contra modelo neoliberal en celebraciones del 1° de mayo". La Nacion (in Spanish). San Jose. Retrieved 7 May 2014. ↑ Archived October 3, 2011, at the Wayback Machine. ↑ Datta, Rekah. "From Development to Empowerment: The Self-Employed Women's Association in India". International Journal of Politics, Culture, and Society. ↑ Weathers, C. (2009). Business and Labor. In William M. Tsutsui (Ed. ), A Companion to Japanese History (pp. 493–510). Chichester, UK: Blackwell Publishing Ltd.
↑ History of the ACTU. Australian Council of Trade Unions. ↑ "Australian Centre for Industrial Relations Research and Training report" (PDF). Acirrt.com. Retrieved 2011-07-27. ↑ Bamberg, Ulrich (June 2004). "The role of German trade unions in the national and European standardisation process" (PDF). TUTB Newsletter. 24–25. Retrieved July 27, 2011. ↑ Kramarz, Francis (2006-10-19). "Outsourcing, Unions, and Wages: Evidence from data matching imports, firms, and workers" (PDF). Retrieved 2007-01-22. ↑ Friedman, Milton (2007). Price theory ([New ed. ], 3rd printing ed.). New Brunswick, NJ: Transaction Publishers. ISBN 978-0-202-30969-9. ↑ Vlandas, Timothee; Benassi, Chiara (2016). Union inclusiveness and temporary agency workers. European Journal of Industrial Relations. Kjellberg, Anders. "The Decline in Swedish Union Density since 2007" , Nordic Journal of Working Life Studies (NJWLS) Vol. 1. No 1 (August 2011), pp. 67–93.